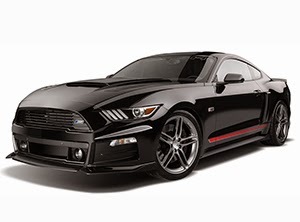 The 2015 Roush Mustangs arriving soon!! our own vision upon," says Jack Roush. 5.0L V8 power has long been the cornerstone of the Mustang legacy. Ford has once again evolved the platform with its 2015 GT Mustang, bringing power up to 435hp / 400lb-ft from the 2014 model's 420hp / 390lb-ft. The 2015 ROUSH Stage 2 Mustang takes this system and adds an abundance of performance enhancements, including an all-new racing inspired front fascia and rear wing, high flow upper and lower front grilles, "ROUSH" badging and graphics, a newly-design ROUSH wheel with ultra high performance Cooper RS3 tires, and more. The 2015 ROUSH Stage 2 Mustang also features the innovative ROUSH Activ8™ exhaust system (optional) with quad tips. The system allows for the driver to easily change the sound level of the exhaust. Other optional components include a 6-speed shifter ball, hood scoop, side graphics, hood graphics, reverse sensing system, quarter window scoops to name a few. "We're excited to incorporate the new Ford I-4 EcoBoost platform into our line-up with the 2015 ROUSH Stage 1 Mustang," says Jack Roush. With the introduction of the 4-cylinder EcoBoost Mustang, ROUSH has taken the opportunity to provide an even more diverse selection of models. The 2.3L turbo-charged engine provides both more power and fuel efficiency than the already impressive Ford 6-cylinder Mustang. The base 2015 I-4 EcoBoost Mustang is rated at an whopping 21mpg city / 32mpg hwy and 310hp / 320lb-ft.
ROUSH has taken this system and added its unique vision for the vehicle, with 17 core component upgrades, including an aggressive front fascia, front grilles, a front chin splitter, rear decklid spoiler, the 2015 ROUSH Mustang Exhaust System with Quad Tips, and more. There is also a wide variety of optional components, including side rocker graphics, 20-inch wheels with ultra high performance tires, hood graphics, instrument gauge cluster, body side scoops, and the innovative Activ8™ Performance Exhaust Featuring Apptiv™ Technology to name a few. Wally's '98 Cobra Mustang Cruising on the Dyno!